The lion is no longer the king of the jungle, the rhino is! Visit here to experience a fantastic adventure of a lifetime with Raging Rhino where you'll get to see the beautiful scenery of the African savannah as well as adorable Rhinos in their natural habitat. You'll also see various other wild animals along the way including leopards, gorillas, and crocodiles! 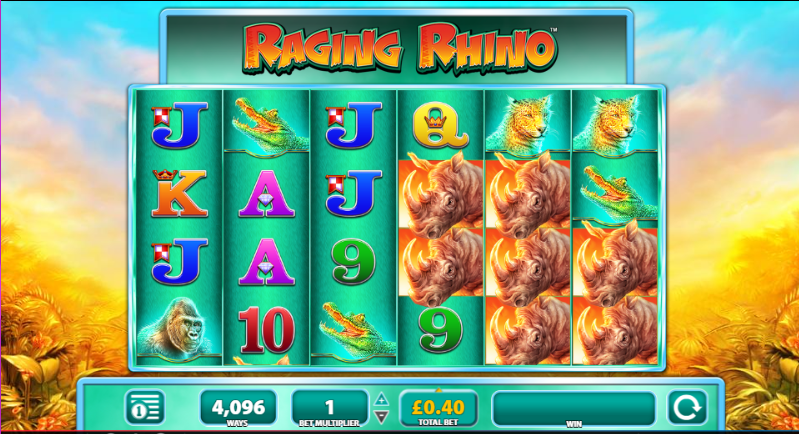 Raging Rhino is a 6 reel, 4096 ways to win slot created by SG Gaming with an African jungle theme. There are plenty of entertaining features including a free spins bonus. Based in the UK, SG Gaming is one of the leading providers of gaming solutions in the iGaming industry. When creating new and exciting games, they always have their customers in mind. They work with gameplayers to ensure that they deliver the best content and technology which exceeds expectations. SG Gaming has a huge collection of games to offer ranging from Irish luck-themed slots like Rainbow Riches Fortune Favours to slots based on popular board games like Monopoly Bring the House Down, and slots with an oriental theme like 88 Fortunes. If you enjoyed Raging Rhino, why not take a look at these titles? Raging Rhino is a 6 reel, 4096 ways to win slot developed by SG Gaming. If you've ever wanted to see a rhino up close or wanted to see your favourite animals on an African safari well now you can whilst also claiming casino promotions. The design is very pleasing with lots of bold colours and adorable 3D animated animals. If you listen carefully enough, you'll also hear sounds of birds and roaring lions from the jungle. Behind the reels, you'll see an ariel view of the jungle filled with lots of tall trees and cloudy blue skies. The symbols include brightly coloured playing cards, snappy crocodiles, raging rhinos, cheeky gorillas, and content leopards. 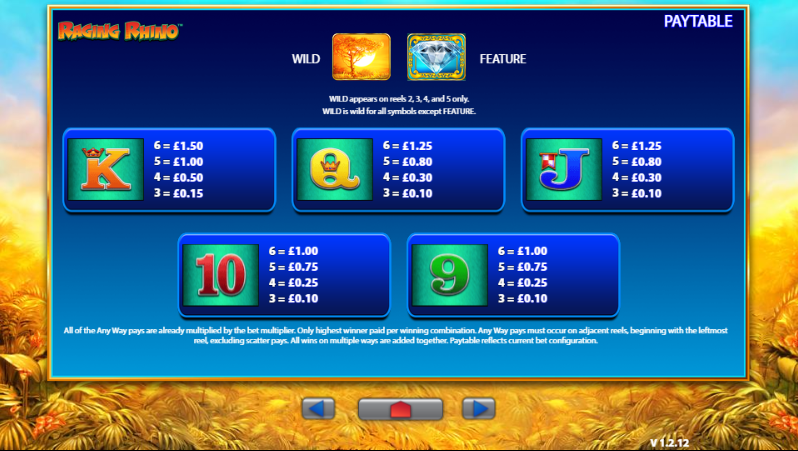 The Wild Symbol - The wild symbol in this slot is the wild jungle logo. The wild only appears on reels 2, 3, 4, and 5 to create winning combinations. Free Spins Bonus - Landing 3 or more scatters will unlock the free spins bonus. Landing 3 scatters will award you with 8 free spins, landing 4 will grant you 15 free spins, landing 5 will give you 20 free spins, and landing 6 scatters will present you with 50 additional free spins. Throughout the free spins feature, all wilds in a winning combination on reels 2, 3, 4 and 4 will turn into WILD 2x or 3x. Raging Rhino allows you to experience an African safari from the comfort of your own home. There's no need to dig out your binoculars as you can observe these majestic creatures on your screen. The design of this SG Gaming slot is beautifully done and the animal noise soundtrack goes along with the theme perfectly. The best feature is definitely the free spins bonus as you can win many extra free spins no deposit to create fantastic wins.